Instead of purchasing new student workbooks each term, purchasing this bundle includes a one-time cost allowing you to print the materials on your own! This includes all teacher and student materials for one educational site, including the license to copy the materials for all students and educators at that educational site. 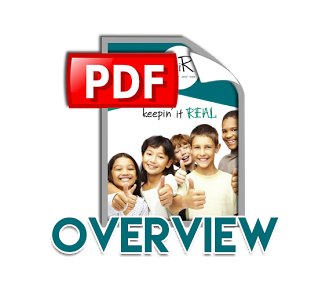 To order the digital version of the complete set of the keepin’ it REAL Program materials with a two year license, click “Purchase” and place this product in your cart for purchase. You will be directed to a link for downloading your files. The keepin’ it REAL drug prevention curriculum is a ten-week program consisting of ten 45-minute lessons for 6th, 7th or 8th grade youth. Using a “from kids, through kids, to kids” approach, the videos and interactive nature of the lessons come from real kids’ experiences. The multicultural bundle includes material appealing to a more urban multi-ethnic population including Caucasian, Latino, and African-American students. This bundle is NOT intended for use with officers or other law enforcement personnel. Please note that this is the NON-D.A.R.E. version of the keepin’ it REAL drug prevention program. It is not available to law enforcement personnel. The non-D.A.R.E. version of keepin’ it REAL is an effective, multicultural middle school drug preventionprogram that has been shown to reduce alcohol, marijuana, and tobacco use. keepin’ it REAL teaches youth to think critically and communicate effectively. The lessons cover risk assessment, decision making, where to go for support, and communication skills such as conflict resolution and drug refusal.REAL stands for the resistance strategies – Refuse, Explain, Avoid, and Leave. The non-D.A.R.E. 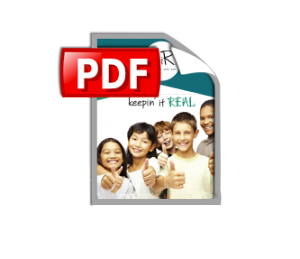 version of keepin’ it REAL is for educators, counselors, and others who work in youth organizations. It is not intended for police officers or current D.A.R.E. officers. Law enforcement personnel interested in the D.A.R.E. keepin’ it REAL are asked to go to www.dare.org where more information can be found on upcoming trainings specifically for law enforcement. A single purchase represents license to use this program within one school or organizational site. Download a full overview of the kiR Multicultural program by clicking the image below.